University police brutalize peaceful protestors at UC Davis; do students bear some responsibility? The video is chilling: a police officer walking along a line of students seated with arms linked, spraying them with pepper spray like one would spray a windowsill for mosquitoes. But these were people, huddling, screaming, non-threatening. Pepper spray, also known as OC spray (from “Oleoresin Capsicum”), OC gas, and capsicum spray, is a lachrymatory agent (a chemical compound that irritates the eyes to cause tears, pain, and even temporary blindness) that is used in riot control, crowd control and personal self-defence, including defence against dogs and bears. Its inflammatory effects cause the eyes to close, taking away vision. This temporary blindness allows officers to more easily restrain subjects and permits persons using pepper spray for self-defense an opportunity to escape. One should be very careful to second-guess police use of force when they are threatened, or when they are dealing with violent people, but there was nowhere near an excuse for the UC Davis police to attack the protesting students. 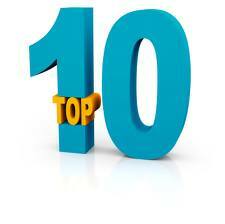 Massive demonstrations have a place in society: many people get more attention than a few. And if you want to make a point make a splash. The more people the more splash. But they’re ethically troublesome. I’ve written recently about the twin dangers of mass demonstrations: the cover that a lot of peaceful people can give to wrongdoers, and the potential for an incendiary clash of wills with the authorities. 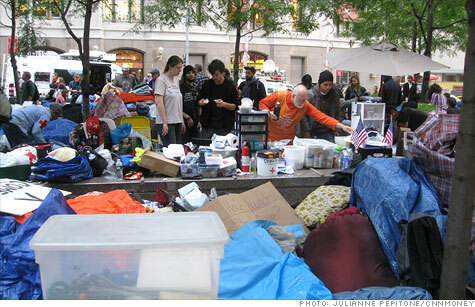 Fortunately America has escaped both dangers in the case of the Tea Party demonstrations, and—so far—in the case of Occupy Wall Street, the latter only when cool heads in New York government prevailed on Brookfield Properties, the owner of Zuccotti Park, to call off their plan to expel the demonstrators. 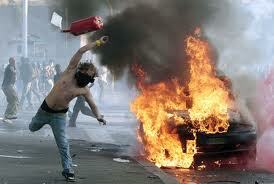 Rome wasn’t so fortunate, as the Occupy Wall Street movement spread there and erupted in violence (Photo). Many in the Occupy Wall Street crowd have stated their intention to stay indefinitely. That’s especially troublesome. One- or two-day demonstrations can be policed and controlled, and with forbearance on all sides can end peacefully. But where there’s no time limit impatience and irritability can build up and inevitably lead to confrontation, and usually ends in violence. 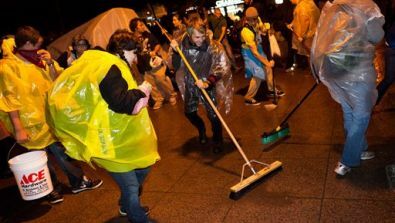 “The deputy mayor of New York City says a planned cleaning of the Occupy Wall Street protest encampment in lower Manhattan has been postponed. Americans pay attention when a lot of people turn out. And so there’s lots of attention for “Occupy Wall Street,” or OWS for short. Thousands of people, mostly of the Millennial generation (born since 1982) are camping out in Zuccotti Park, just two blocks from Wall Street’s New York Stock Exchange. The Right doesn’t like OWS: “I think it’s dangerous, this class warfare,” Mitt Romney opines. “Growing mobs,” snarls Eric Cantor. “Anti-American,” Larry Kudlow charges. “The beginning of totalitarianism,” warns Ann Coulter. OWS comprises lots of people, diverse in temperament, opinion, and goals, but they are engaging in old-fashioned American protest, this one against corporate greed, social inequality, and joblessness. Some dismiss them as incoherent, but that’s a mistake. They’re angry about the way our society has moved away from the American dream and toward greater and greater inequality. Like them or not, OWS is a growing force. Our country needs to take their complaint seriously. They may be as consequential as Tahrir Square. Or more. Or maybe not.